Why do I need Gigabit service? Gigabit is not about one device or computer, it as about providing plenty of bandwidth for the entire home, just like having power or water being brought into a home. The point of having a Gigabit connection is not superfast speeds for ONE computer or device, it is to provide fast speeds for DOZENS of devices on the typical home network so that no matter what you are doing online no one in the home experiences slow speed issues. The future of the internet is fast. Fourteen times faster than the 70 Mbps the US averaged download speed in March 2018. Gigabit-speed fixed broadband is still rare, but it’s making appearances in locations over the globe; including our hometown. Before you get too attached to the idea of downloading 1 billion bits of data per second, know that getting gigabit service and adjusting your device set-up to achieve top speeds is harder than you might think. Citizens is here to prepare you for Gigabit Internet service by offering a few tips to help you achieve the Speedtest results you dream of. Some of these will help you maximize your potential internet speeds even if gigabit is not available to your home at this time. Is gigabit-level service available to your home? While internet service providers (ISPs), municipalities and companies like Google have been making headlines with gigabit (the ability to download 1 billion bits of information in one second), service is still rare. However, Citizens is constructing fiber and is in the process of deploying FTTH (fiber to the home) service in communities that we serve. What kind of infrastructure is your service delivered over? You’ll get the best speeds with fiber because you won’t have to deal with the noise or interference that occurs over copper lines. However, new coaxial technologies, namely DOCSIS 3.1, have the potential to provide gigabit speeds, but not symmetrically (see the next point). Finally, phone lines, used for DSL, will become obsolete. Having fiber doesn’t mean you’ll automatically have gigabit; the 1 Gbps service still needs to be available in your area. Is the available service plan symmetrical or asymmetrical? Symmetrical service is advertised as the download and upload speeds the same. This varies by ISP, but asymmetrical service is more common for residential service - gigabit service requires the robustness of a fiber optic connection. Citizens offers several Business Ethernet plans with symmetrical speeds to meet any business needs that you may have. Understand the network located upstream of you. And the quality of that network matters. Citizens closely monitors our network to ensure that no one experiences slower speeds during peak usage times due to network capacity, however, we cannot guarantee speeds beyond our network. This also applies to peer-to-peer connections. If you’re downloading games and/or streaming movies, your performance is impacted by both the quality of the network those applications are using and how fast those services allow content to be downloaded. Gigabit service is great for ensuring that multiple users are having a consistent internet experience, but don’t expect to be downloading games from Steam at gigabit speeds. Steam’s (a popular gaming site) network could have bandwidth restrictions per connection in order to manage their traffic. Also with gaming platforms like Playstation and Xbox you will not see gigabit speed test results. These platforms go back to specific networks and those networks have their own network management practices which limits the speeds per connection. For example: do not be surprised if your PS4 using an Ethernet connection can only speed test at 200 to 300Mbps. Data overhead makes 1 Gbps a theoretical number. Though perfect circumstances might allow you to send 1 billion bits of information per second, some of those bits are overhead (including preamble, inter-frame gaps, and TCP) and your actual data throughput will be a little smaller. If there was no overhead, you might be able to achieve a Speedtest result of 997 Mbps, but you’re more likely to top out at 940 Mbps. For more details on the math, read this. Good quality wiring is essential. To achieve the fastest speeds possible, the most important thing you can do is use CAT 6 ethernet wiring to connect your devices to your modem and/or router. The same can be achieved using CAT 5e but you’ll get less crosstalk using CAT 6. Keep in mind the 100-meter length limitation on obtaining the specified maximum speed. If you’re going to spend the money on new cables, it’s worth future-proofing your investment. CAT 5e supports up to up to 1,000 Mbps while CAT 6 supports ten times that. Also, don’t run your data cabling parallel to power lines — interference from the power lines can cause interference in the ethernet cabling. An important note is that all 8 wires (4 pairs) must be used in both CAT5e and CAT6 to obtain the speeds 1Gbps. You cannot "split" any pairs to avoid a separate cable run for a 2nd ethernet connection or for a phone line(s). For example, we have seen homes that only used 4 wires of the CAT5e for ethernet and another 2 wires were used for the phone line; when doing this it reduces the maximum obtainable speed on the ethernet connection to 100Mbps. Also, do not "daisy chain" your CAT5e or CAT6 cables, these need to be "home runs" to a centralized location (also called a "Star Configuration"). If you are using a CAT 5 cable and only seeing speeds of 300 - 400Mbps, that is the maximum speed for a CAT 5 cable over short distances. Please replace your cable with either a CAT 5e or CAT 6 cable (recommended). Are both the ports and the CPU in your router gigabit-ready? Read the fine print when choosing a router. Not every consumer-grade router can support gigabit speeds over the ports in the back. And sometimes the ports support gigabit but the router’s CPU can’t keep up. In general, x86 processors are fastest, followed by ARM and then MIPS. Typically you’ll find that recently-released and the more expensive consumer grade routers are up to the task. 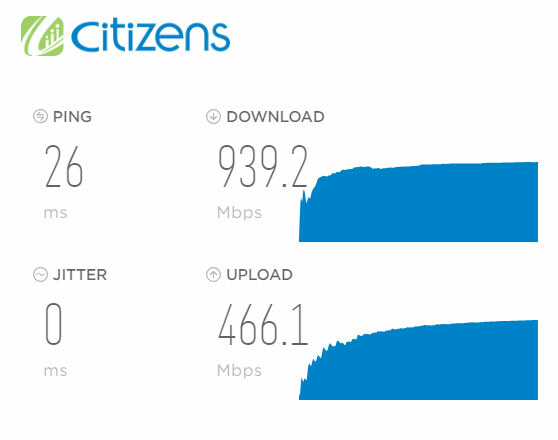 Citizens uses commercial/enterprise grade equipment that can support these speeds. Our equipment comes with 24/7 Technical Support to keep you connected in case of unforeseen issues. While Wi-Fi technology is catching up, you’ll still likely see much better speeds if you plug that CAT 6 ethernet cable directly into your computer. Not all laptops have ethernet ports, so you’ll need an adapter for a hardwired connection. Make sure the adapter you’re using is gigabit capable. Thunderbolt and USB 3.0 adapters are usually good, but the performance of other adapters varies widely. And don’t forget, USB based adapters also add data overhead. If you must use Wi-Fi, pick a clear channel and sit close to your router. All kinds of things can interfere with your Wi-Fi signal and thereby slow down your connection: fluorescent bulbs, baby monitors, cordless phones or even a cheap pair of wireless headphones. This is critical for Wi-Fi performance as only one device can use the channel at a time. In addition, Wi-Fi uses CSMA-CA to handle collisions — if it detects a collision on the channel, the Wi-Fi device will halt sending and wait until the channel is clear. Interference counts as collisions, so you will end up with a sporadic and halting connection with interference nearby. If your connection is clear, attenuation (signal drop over distance) is a very real problem when using Wi-Fi. The 2.4 GHz band handles attenuation better but is more subject to interference. The 5GHz band is less subject to interference but has more issues with attenuation. Either way, you’re still likely only to achieve speeds topping out around 600 Mbps. If you are on the 2.4 GHz band, make sure to choose from channels 1, 6, or 11 — those are the only non-colliding channels at 20 MHz. At 40 MHz, you will pretty well consume the entire 2.4 channel spectrum, thus, it will be even more at risk of interference. Make sure your computer is using the latest Wi-Fi standards. The nonprofit Wi-Fi Alliance keeps a close eye on these standards. In 2016 they announced Wi-Fi CERTIFIED ac standards which include Multi-User Multi-Input Multi-Output (MU-MIMO), 160MHz channels, quad-streams and extended 5GHz channel support. These standards change as technology improves, so check to make sure you’re working with the latest certifications. And just because your router supports these standards doesn’t mean your laptop or wireless device does. If your home WiFi was not purchased the last couple of years and you didn’t spend hundreds of dollars for it, the odds are that it is not MU-MIMO and/or it doesn’t meet the new AC (802.11ac) standard. 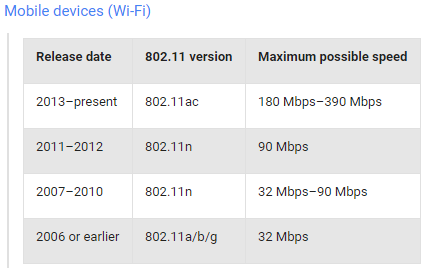 IMPORTANT NOTE: Make sure that all the connected devices on your Wi-Fi router are using the latest Wi-Fi standard. If you have older Wi-Fi devices they are limited to slower speeds, and they will slow down the speed for all other Wi-Fi connected devices on that same band. For example: if you have 802.11g device (uses 2.4GHz band only) that is connected to your Wi-Fi router at 20Mbps, all other devices using the 2.4GHz band will slow down to that speed (20Mbps). Decipher the hype behind the marketing. For example, a wireless router that says it can support 4 gigs doesn’t necessarily mean it can support one 4 Gbps connection. It’s more likely that the device has four radios with 1 Gbps specified maximums (real world performance is likely to be slower). Typically most WiFi router manufacturers advertise that total for the WiFi speed which is the combined maximum speeds on the 2.4GHz band and the 5GHz band. For example one WiFi router claiming 2200 Mbps of speed was actually 450 Mbps on the 2.4GHz band and 1733 Mbps on the 5GHz band. Stay up to date on router firmware, but don’t update on day zero. Vendors regularly release software updates for their routers to improve their stability, performance, and security. It’s usually always the best option to stay up to date with these firmware patches. If you have Citizens Managed Wi-Fi service, you don’t need to worry about staying up to date on the firmware, we take care of that for you. Use desktop apps to run your Speedtest. If you’re sure your setup is perfect but you’re still not seeing the Speedtest result you expect, we highly recommend that you download Speedtest.net’s free desktop apps for Windows or MacOS. Many lower performance systems can’t reach 1Gbps via browser tests due to various limitations. Plus desktop apps give you data on jitter and packet loss. This app allows you to keep a history of your speed test and allows you to share your results. Also, ensure that all other devices are disconnected from the network or offline, or preferably powered down. Often smartphones and tablets can be running updates even when they are not in use and this can impact speed tests. We recommend using one of the following speed test sites if you elect not to use the desktop app. Both sites allow picking another server in another city. Keep in mind that the further the distance the more networks your speed test has to cross and that even under the best circumstances that adds latency which impacts ping times, jitter, and speed results. If you get bad test results to a particular site, try a couple of more, one site might have heavy traffic or a network issue that is impacting the results. Is your Computer/device up to the task? Having a Network Interface Card (NIC) being rated for 1000-Base-T may not be enough. NICs that use software offload instead of hardware offload are often found in older, cheaper computers and struggle to support gigabit speeds. Intel offers some of the best driver and hardware support on their NICs. You need to have plenty of RAM, we recommend on a Windows 10 computer at least 8GB of RAM preferably 12GB or more. You will need a minimum of a 5th gen (generation) Intel processor that is an i5-5500U or i7-5500U or better. A SSD (solid state drive) hard drive is highly recommended for best test results. If you have a mechanical hard drive or HDD (hard disk drive) storage this can impact your test results. Do not speedtest from your gaming console (PS4, Xbox, etc.) these all peer back to their preset network and those networks have network management practices that rate limit connections. At this time the maximum speed test results on those networks from the gaming consoles appears to be around 300Mbps using an Ethernet connection. Understand the network located upstream of you. Is your Anti-Virus and/or Firewall impending your speedtest results? Simply turning these off temporarily during your speedtest can dramatically impact your speedtest results. See the two example speedtest below from the same computer and compare the differences. If you have a laptop without a Gigabit Ethernet port you can use a USB 3.0 to Gigabit Ethernet adapter, but please note that using such an adapter typically uses an additional overhead of about 5% or 50Mbps. Encryption can be slow if it’s not done right. Temporal Key Integrity Protocol (TKIP) encryption, often enabled by default on Wi-Fi routers, will slow you down.. Use Advanced Encryption Standard (AES) instead as it’s often hardware accelerated. The standard for WPA2 encryption, AES is both more secure and faster than TKIP. Some routers have TKIP options for compatibility reasons, though, even if you’re using WPA2, so check. Quality of Service (QoS) shaping on a router can help you prevent large downloads from eating up all your bandwidth. But on consumer hardware, you’re also bypassing hardware acceleration so all your packets of data have to be inspected by the main CPU. This can cut your performance by 10x on a high bandwidth connection. Is gigabit worth the trouble? You may be thinking, “Getting the fastest internet speeds sure is a lot of work.” For some people hitting the maximum speed is worth any amount of work to get there. Others will be more than happy with the 300, 400 or 500 Mbps that they see on their gigabit plan. Is the upstream network robust enough? Did you account for data overhead? Are you using Cat 6 cables? Do you have a quality adapter? Is your Wi-Fi channel clear and access point nearby? Is your computer using the latest Wi-Fi standards? Have you cut through the marketing hype? Are you using the free Speedtest desktop app? Is your router's firmware up to date? Is your NIC up to the task? If you're using Wi-Fi encryption, is it WPA2 +AES? Did you turn off QoS shaping? If you answered “yes” to all of the above questions, congratulations! You’re now ready to unlock that superfast Speedtest result.